Whether Your Glass Is Half Full or Half Empty, You Still Have Water, Right? A couple of weeks ago I was speaking at an event where the overall mood of the attendees before I went on appeared to be a little negative at first glance. I usually try to make it a point to speak with as many people as I can beforehand just to get a bit of a gauge of how everyone is doing in their businesses and what their outlook is. I do this because I truly believe that in addition to supplying entertainment, I was hired to make a difference in their businesses/lives and to do that I need to know what part of their thinking or systems needs an adjustment. I started out by telling this audience of about 1,000 attendees how to survive if they are ever shipwrecked and get a cramp in their leg while trying to swim to safety – seems a little strange for me to open with, right? I told them that if you experience a cramp which hinders your swimming ability to the point that you are going to drown the smartest thing to do is to bite your tongue or do something else that will cause a greater pain in your body than the cramp that is keeping you from swimming. The reason you would do this is because the body can only feel one pain at a time and if you create a pain greater than the pain of the cramp, you will be able to swim to safety without allowing the cramp in your leg to stop you. So here is the obvious question – what in the world does this have to do with your business? Focus and perspective are everything in your business and if you find that you tend to be a negative person or have a negative outlook on your industry, you may want to make some adjustments. Just like your body can only experience one pain at a time it can also only focus on so many problems at one time. But here is a little breaking news for you – you are always going to have problems or there are always going to be bad things going on around you. And every time you solve one problem, it seems there is another one waiting around the corner. Life never promised us a problem-free existence – only that we would have the ability to make it through whatever problems come our way. But here is the bright side – you are also always going to have people and things in your life that you can be grateful for and appreciate. Now it is just a matter of which you will focus on. 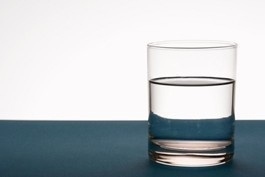 The most common litmus test for whether someone is an optimist or a pessimist is whether they see their glass as being half full or half empty. From my view point, either way they both have water right? That is something to be grateful for. Think of it this way—if one person tells me that this is one of the most challenging markets they have ever faced, that 35% of transactions are affected by appraisals and that lenders are about to tighten their standards even more than they already have for borrowers—are they wrong? If another person tells me that the Wall Street Journal just declared an official end to the housing bust, that the home affordability index is at an all-time high and mortgage rates are at an all time low, that multi-family and commercial loan originations just increased by 25% and that we are able to communicate easier now than at any other time in history—are they wrong? Of course they are both right but the real question is which one of these belief systems benefits you? Why would you choose a way of thinking that will lead you to always see the glass half empty? When you have an overall negative outlook on your industry, it affects your actions. When you believe that a certain percentage of your deals are destined to fall apart because that is the way the market is right now, that is going to affect how hard you work to keep them alive. But when you believe that you are in an amazing market with more opportunities for those that work hard, when one of your deals starts to go sour, you are going to do everything possible to keep it alive because at your core you don’t think it would be normal for one of your transactions to fall victim to this market. When we focus singularly on one thing we are not able to focus singularly on another at the same time—just like we can’t focus on two pains at once. The question is, will you focus on the good things happening in the market or the not-so-good things? If you don’t believe this is true take a minute and watch this video and experience what I am saying in action. Jared James is the CEO and Founder of Jared James Enterprises, an internationally sought-after speaker and trainer. James built one of the fastest-growing real estate teams in the country, was inducted into the International Hall of Fame for one of the world’s largest real estate companies and wrote a best-selling book—all before the age of 28. As an acclaimed speaker, James keynotes events for major real estate organizations and conducts regular webinars and training for nationally known organizations like NAR, CRS, Yahoo Real Estate, Trulia and Zillow Academy and blogs regularly for RISMedia. To stay in touch with Jared James, visit www.facebook.com/jaredjamestoday and www.twitter.com/jaredjamestoday or visit his website at www.jaredjamestoday.com.